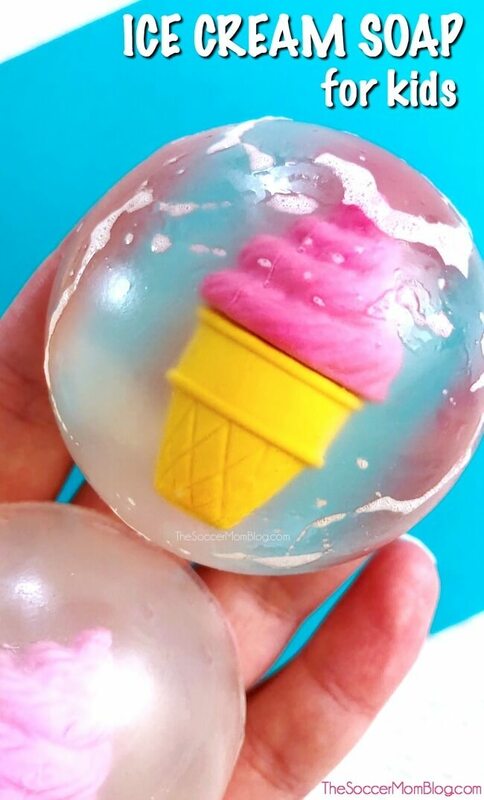 Make bath time a treat with this colorful homemade ice cream soap for kids! Have you seen the adorable themed mini erasers that Target sells in their “Dollar Spot” (or the location of the store formerly known as the dollar spot but is now really the $1 to $7 spot)?? They are so cute and usually sell out quickly! My teacher friends are always looking for the next batch to be released. PS- If you can’t find these erasers at your local Target, I’ve included a link to a similar set on Amazon in our supply list below. 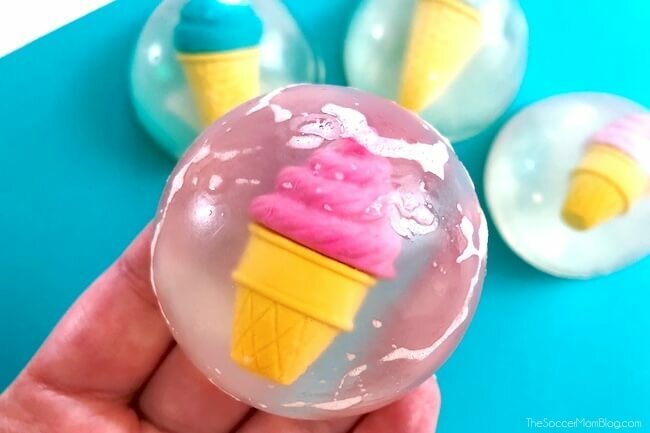 Not only will kids have fun using these homemade glycerine soaps, but they can help make them too! You can even customize them with your own favorite type of mini erasers! Related: We love to make natural beauty products for moms too, like this Vanilla & Honey DIY Lip Scrub and this Cotton Blossom Homemade Sugar Scrub. For your convenience, I’ve included shop-able ad links to some of the products used to make our homemade glycerine soap for kids; read our disclosure policy here. 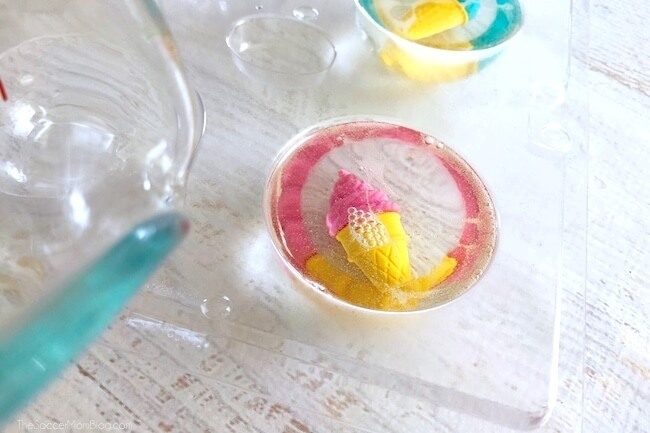 Depending on the size of your soap molds, this recipe will make about 4 ice cream soaps. Cut glycerine soap block into 12 pieces, each about the size of an ice cube. Depending on the size of your block, there may be some leftover for future batches. 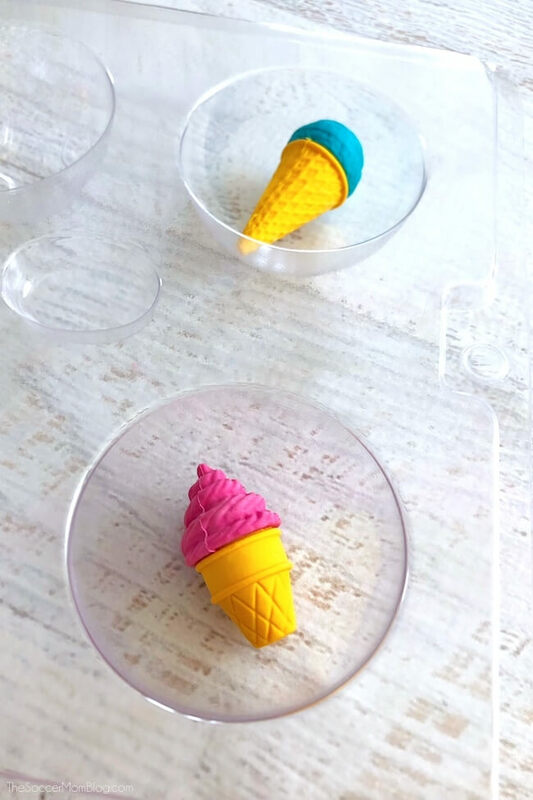 Place one ice cream cone eraser in 4 half circle molds. 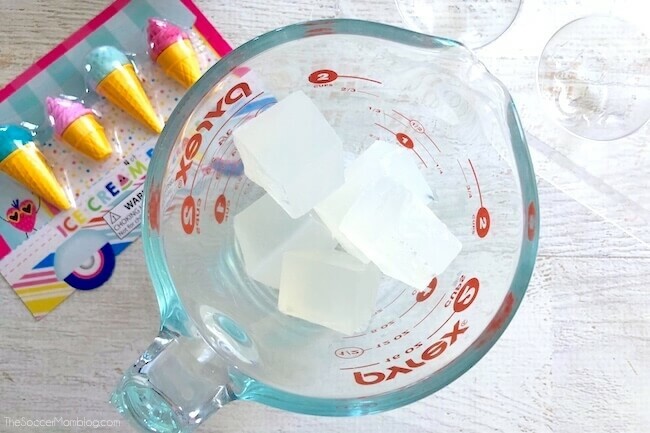 Add the 12 glycerine soap cubes into a microwave-safe bowl or measuring cup (which would be easiest for pouring) and microwave 1-2 minutes until melting. Safety Note: Adults should do the microwaving, unless you are confident that your child is of an appropriate age to handle this step. Bowl and contents may be very hot. Always perform under adult supervision. Stir about 5-7 drops of your essential oil into the melted glycerine soap, then carefully pour into four of the half-circle soap molds. PRO TIP: Spray the top of your filled molds with rubbing alcohol. This will help prevent air bubbles from forming. Place filled soap molds in freezer for 30 minutes to set. When ice cream soaps are completely solid, carefully stretch the sides of your silicone mold and press up on the bottom to remove your soaps. They should pop right out! Be sure to check out our Homemade LEGO Jelly Soap for Kids too! This post includes a video tutorial so you can SEE how it’s done too!